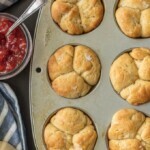 Dinner Rolls are a must make for any family get together, especially the holidays! These Christmas or Thanksgiving Dinner Rolls can be prepped ahead of time and stored in the fridge (Ice Box Rolls!) until ready to bake. This Dinner Roll Recipe is the perfect easy homemade bread for every occasion, especially a sit down dinner with those you love. Impress your holiday guests with these delicious bread recipe. Place the shortening, sugar and salt in the bowl of a stand mixer. Pour the boiling water over all. Stir on low until shortening melts and the sugar and salt have dissolved. Let stand until the mixture registers 110°F. In a 1-cup measuring cup, combine yeast and warm water. Be sure water is between 105°F-115°F. Stir with a fork approximately 10 times and let stand 5 minutes. Add the yeast mixture and lightly beaten eggs to the shortening mixture, and beat on low until combined. Add the flour, ¼ cup at-a-time, while mixer is on low speed. This should take 2-3 minutes. Dough is ready when it begins to pull away from the sides of the bowl. Dough should be very soft and smooth. Place the dough in a large, lightly greased mixing bowl. Turn the dough over in the bowl, so all sides are greased. Cover the bowl with plastic wrap and refrigerate 8-24 hours. When ready to use, place the amount of dough needed on a floured surface. (Cover any remaining dough with plastic wrap and keep refrigerated up to 24 hours, total.) Knead the removed dough until smooth and elastic, approximately 2 minutes. Lightly grease a muffin pan. Shape dough into 1-inch balls. Dip each ball into melted butter then place in a muffin cups. Place three balls, side-by-side, into each muffin cup. Cover rolls loosely with plastic wrap or clean (lightweight) dishtowel. Allow dough to rise in a warm place (85°F-100°F works best), until double in size (approximately 45-60 minutes). Preheat oven to 400°F. If desired, sprinkle rolls very lightly with flake sea salt (like Maldon’s). Bake rolls 8-12 minutes or until golden brown. Brush with remaining butter and serve immediately.